Both the oldest and the youngest – well technically, it is a NAS – of official 70s Rosebanks at a go. You might find others like the 8 yo, 12 yo, 15yo from this time. Also, the officials of this time were bottled under the Distiller’s Agency, one of the predecessors of today’s Diageo. 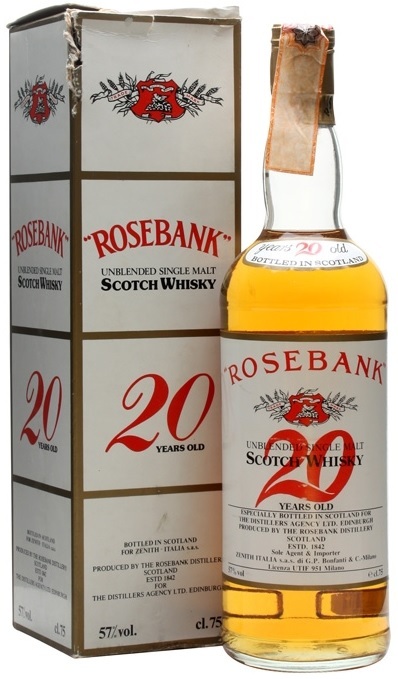 Bear in mind that Rosebank was triple distilled, and yet I found some quite phenolic notes in both whiskies. Some time ago when I first tried old Rosebank, I said goodbye to the modern misunderstanding that triple distilled always means light and delicate whiskies. Nose: Somewhat thin but freshly cut camphor and dried grassy green medicinal herbs strung up in some herbalist’s shop. The result is a thin medicine in a light oil suspension. A malt candy core. The very faintest dried out zest like a months old orange at the back of the fridge. And one completely dried out finger of ginger root. Palate: As feared 70 proof is too weak. A damp wood drawer with, some leftover spice dust turning somewhat dank in the recesses, old black peppercorns. A thin and light body, and old bottles. Finish: Short, and more musty hints. Not the best Rosebank. Nose: Rather immense, but rather ‘defined’ as they say. Some thick vegetable oil and melted wax, old scratched copper pots and deep deep citrusy zests. Also sooty stoves, and dirty leather. Not light or delicate as what the prevailing view of a Lowlander is. So completely different from 90-92 Rosebank. And to be clear, rather excellent. Palate: Superb, huge delivery. and dare I say better than the nose suggests. Lots of little phenolic notes like coal, oil, wax and soot, but with a citrusy sharp edge, and a certain clarity. Finish: Long, dried out wood, dried out wax drippings, citrus sharpness which turns quite cutting. Worth more than many 90s Rosebanks I think.. Increasingly rare too. This entry was posted on February 8, 2017 by Whiskyrific in Rosebank and tagged Rosebank.